Anybody who has worked on a halfway serious VBA project knows how hard it is to follow a standard Git workflow with feature branches. Sure, you can export the VBA modules, but the export/import process can get messy and you will need to resolve merge conflicts outside of the VBA editor without code completion which makes it harder to spot syntax errors. 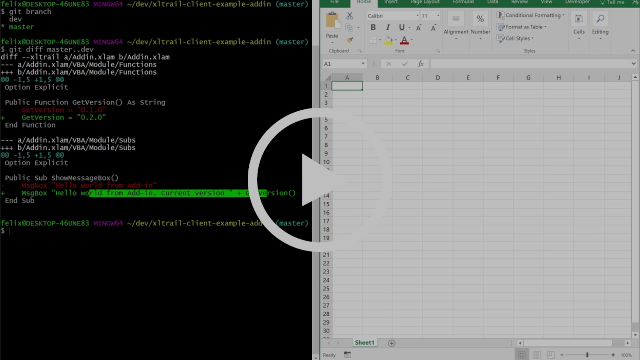 The latest version of xltrail client, our free Git extension, allows you to use "git diff" and "git merge" directly on your VBA modules inside your Excel workbooks. On top of that we've added basic support for sheet diffing which allows you to spot which sheets have changed. Click on the button to read the blog post or watch the short video below. When xlwings started back in 2014, GitHub did not have a way of voting for issues. This is why we also opened a uservoice forum for feature requests where users could vote. In the meantime, GitHub issues allow to add "thumbs-up" etc. emojis to let others express how hot a feature request is. In order to bring everything onto one platform, the uservoice forum is now read-only and new feature requests have to be opened on GitHub issues directly. xltrail client 0.3.1 (Git Extension): added support for git merge and basic sheet diff, see blog above and details. xltrail server 1.7.1: bug fix release see details.